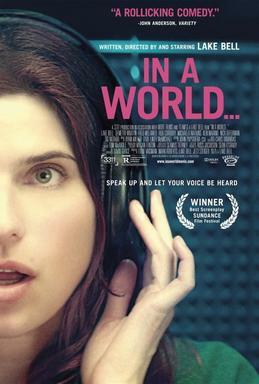 Carol Solomon (Lake Bell) makes a living (more or less) doing voice work and teaching celebrities to perfect their accents. She’d like to break into her father’s business doing voice-over work for movie trailers, but the industry doesn’t want a female voice. But a huge gap has been left by the death of Don LaFontaine (the real-life king of voice-overs) so she finds herself competing against her childish and jealous father, an industry giant, who champions his smug protegé, up-and-comer Gustav, to revive the “In a world…” work. This film does a lot of things well, but I really enjoyed watching a woman try to break into a male-dominated industry, and witnessing the different things that need to fall into place in order for it to happen. Unfortunately, there’s also a lot of back-stabbing and sabotage that goes on as well, some of it by Carol’s own father, a man who believes that there is no place for women in his workplace (and that things were better off when there weren’t women in any workplace, period). But this is not some heavy drama about sexism. I mean, first of all, there’s Eva Longoria, as herself, learning how not to sound like “a retarded pirate” (this is her attempt at a Cockney accent). Longoria seems pleasantly game and wins some major not-taking-herself-too-seriously points. Then there’s this: (are you sitting down? you may want to sit down.) DEMITRI MARTIN and NICK OFFERMAN in the same movie. In the same scene! In the same several scenes! I nearly fainted from the awesomeness. They play the good dudes who actually believe in Carol and want to help her succeed. This movie is Lake Bell’s baby – she wrote it and directed it. She casts this movie like it is her baby, like she knows she has to get everything perfect, and does. She surrounds herself with talent and milks it for every ounce, but she’s no slouch: listen carefully and you’ll hear her own voice-over work sprinkled throughout the film. Girl’s got chops. The script is a lot of fun, there’s a lot of great lines, and great opportunities to showcase herself from every angle. Watch out for Lake Bell – she’s been popping up in random places over the past few years, but with this effort, she’s truly made herself known. This entry was posted in Jay and tagged female directors, Geena Davis, Lake Bell, Netflix and chill, Nick Offerman, surprise cameos on December 9, 2014 by Jay.